Watermarble Nails for the #31DC2016Weekly - Polish Etc. For week 20 of the #31DC2016Weekly, we are doing watermarble! 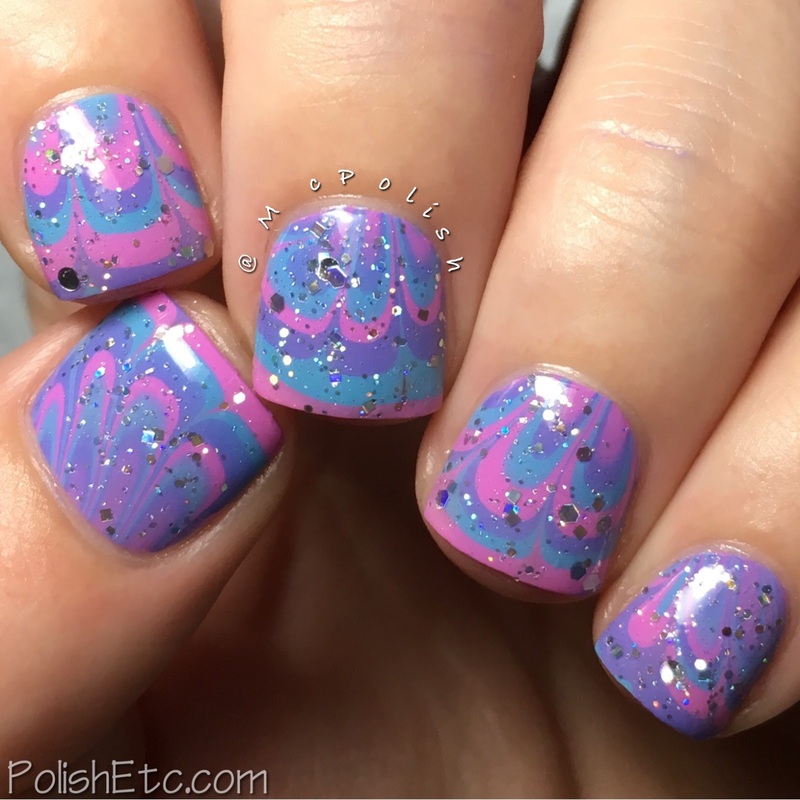 Oh, the dreaded watermarble. This is typically the hardest prompt for people. I am still not that good at doing this technique. I have had the most success with jelly polishes and Pipe Dream Polish cremes. Every year, I use some of the Pipe Dream Polish cremes to do this prompt. 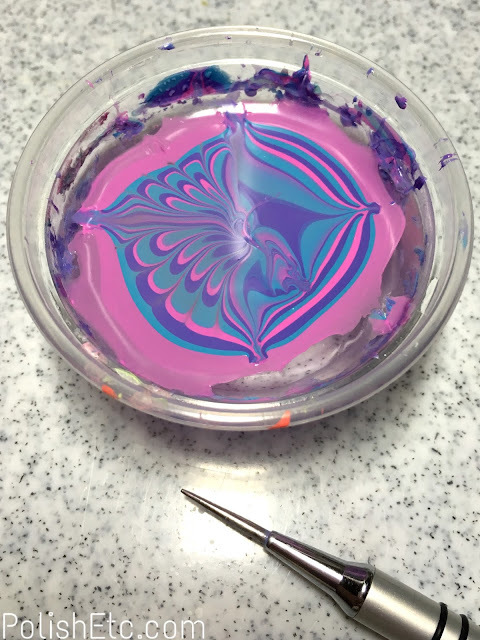 They just watermarble so well! This year, I used three polishes from the Mellowed Out Cremes collection. Unfortunately, they are no longer available. But Pipe Dream Polish does have a new collection of Tie-Dyed Jellies out right now that watermarble very well. I haven't been able to snag them yet but I plan to! For this mani, I used three colors: Chillax (dusty blue), Peace Out (dusty purple) and Peace Out (dusty orchid pink). They applied smoothly and I did not use a base color under my watermarble design. So what you are seeing is just one coat of the watermarble over the bare nail. They are super opaque! I would like to say that it only took me one try for each nail but I had to redo the watermarble design over and over again. Like I said, I am not a pro. Then I just had to add a little bit of holographic bling to the mani. Everything is better with a little sparkle, right? I topped this manicure off with a think coat of Ride the Boogie, also by Pipe Dream Polish. It is a simple topper with silver holographic glitters of various sizes. I hope you liked this manicure! Watermarbles are always hard and I am stoked when they come out nicely. This ends the second part of the #31DC2016Weekly. Next week, we start the home stretch and the most difficult themes. I will have to use my creative brain much more for the rest of the challenge. 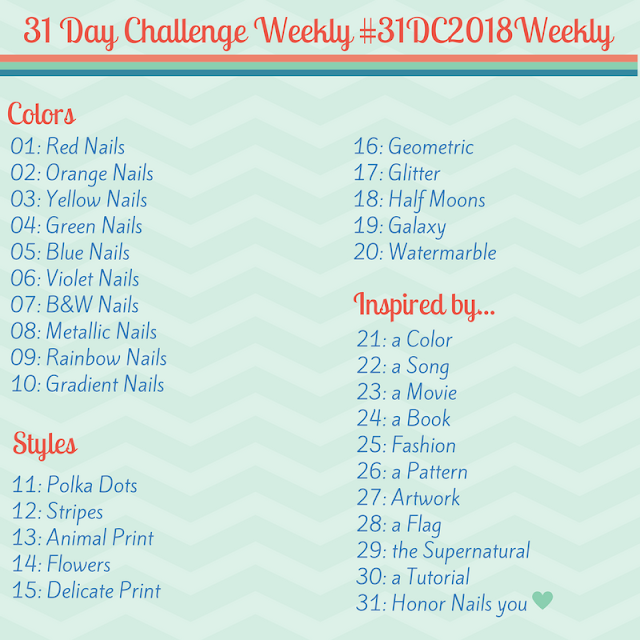 If you want to check out what other ladies have been doing for the challenge this week, check out the tag #31DC2016Weekly on Instagram, Twitter and Facebook!